Grant Notley was an extremely influential person to many Albertans during his reign as leader of the New Democratic Party in Alberta. His dedication, commitment and hard work was recognized and respected by his fellow politicians as well as those of all political sectors. In recognition of his achievements and contributions to Albertan’s, UFCW Local 401 has ensured his name and legacy lives on through the Grant Notley Memorial Scholarship. 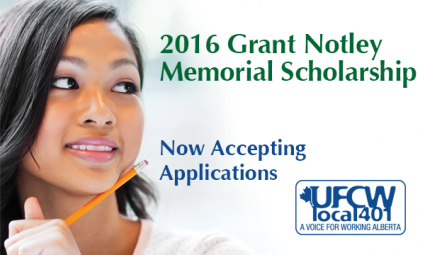 The Grant Notley Memorial Scholarship is available to UFCW Local 401 members and their immediate families. Immediate families shall include and be limited to spouse and children. The members of the Scholarship committee and their immediate families shall be excluded from this compensation. Any individuals who have previously received a Grant Notley Memorial Scholarship are also exempt. Only applicants who have been a member or are sponsored by another family member with at least six months seniority as of the yearly deadline date, will be considered. The Grant Notley Memorial Scholarships may vary in value from $500.00 and up to $2,000.00. Each Year there is up to $25,000.00 allocated for disbursement to eligible applicants as stated above who enter into a post-secondary educational institution. An application to this scholarship consists of a three part essay as well as being accompanied by a passport size photo. We encourage you to keep posted for this year’s requirements. Check out the application information!